Helfa Gelf – Call for artists 2017 | News by Wales Express News, People Before Profit! The biggest open studio project in Wales will enter its twelfth year in September. Helfa Gelf is calling for artists and craftworkers to join this exciting event and register before 8th May. Last year, over 250 artists in over 120 studios and galleries across the counties of Gwynedd, Conwy, Flintshire, Denbighshire and Wrexham took part and the event organisers are hoping for a similar response this year. “We are excited to have successfully gained funding this year. This is a fantastic opportunity for all artists across North Wales to join the Helfa Gelf Art Trail. We also are running a fantastic training programme for artists. The closing date for applications is Monday 8th May, so please go to the website and register today,” says Menna Thomas, Helfa Gelf Coordinator. Helfa Gelf has developed over the last eleven years with Silver or Gold Membership required to join the event in September. Bronze Membership is available throughout the year, if you miss the 8th May deadline. All membership categories offer opportunities for exhibitions, residencies and half price training. Details and a secure payment portal is available online at https://helfagelf.co.uk/accounts/register-as-an-artist. Tara Dean, artist and printmaker in her studio. 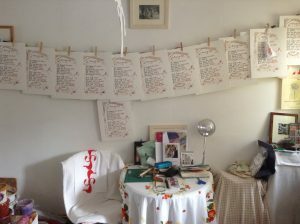 “The open studios event enables artists and makers to showcase their work to the public, collaborate with other artists and develop their practice. This year we have a number of informal networking events for artists across North Wales to socialise, talk about their work and share tips to help make the most of the event.” says Menna. The online application process closes on 8 May 2017. Bronze annual membership costs £35, Silver £60 and Gold £110 and artists must be resident in Gwynedd, Conwy, Flintshire, Denbighshire or Wrexham. 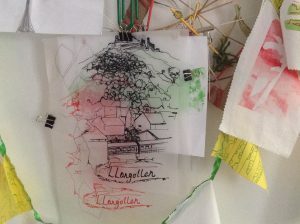 Funding through the Arts Council Wales, supported by the National Lottery, and is sponsored by the Welsh Government plus support from the local Authorities across North Wales has allowed the development of the Helfa Gelf Art Trail. Artists can choose which of the first four weekends in September to open from 11am to 5pm, with a late night on Fridays 8pm to 10pm. For more information, go to https://helfagelf.co.uk where the application form is available online.